Don’t leave for your vacation without reading these Disney World hacks. They will save you time and money and help you maximise the magic! Disney World is quite literally my favorite place on earth! My first trip was more than 30 years ago and my kids had visited 6 times before they turned 6. In that time we sure have learned a lot of tips and tricks to help maximise the magic, and help us save time and money. When we travel with extended family they’re always amazed at how much we get done without spending hours waiting in line. These Disney World hacks are like gold, and I love sharing them with y’all so you can have magical vacations too! Be sure to save this post to your Pinterest account so you can refer to it again later. There are lots of hacks here for you! After all these years of travelling to Disney World I’ve managed to get my packing down to a fine art. Here’s a sneak peak at some of my top packing hacks, you can see the rest of them in our list of things to pack for Disney your vacation that you might not think of! You’ll want to remember the Magic by picking up souvenirs during your trip so be sure to pack an empty bag to carry them home in! Spending time in the themeparks in the hot Florida sunshine is thirsty work, but at 4 bucks a bottle buying water can put a dent in your budget. Bring an insulated refillable bottle from home instead and ask for a free cup of water at any of the quick service restaurants. Find out what else you should carry in your park bag. Whether you’re checking your fastpass reservations or ordering food on My Disney Experience or taking photos of your family you will burn through your phone battery far quicker than you do at home. There are charging outlets in the park but you’re much better off bringing a pocket charger with you. We would not be without our Anker power bank. Oh and it is worth bearing in mind that the more power it has the heavier it will be! Whether you want to stay dry on Splash Mountain or during a short Florida rain shower you’ll save a lot of money by picking up ponchos from the Dollar Store or Walgreens instead of buying them in the park. Oh and speaking of ponchos, here are some fun things you can do in Disney when it rains! Your Magic Band is your “key” to the World so you need to keep it safe. They can ping off quite easily (ask my husband, he lost his twice at Typhoon Lagoon) so keep yours secure with a Magic Band lock. I’m always saddened when friends come home from Disney World and complain about how it was so tiring and they didn’t get to see what they wanted because there were so many lines. If you want to make the most out of your trip you need to set aside some time beforehand to PLAN. Here are my favorite planning hacks. 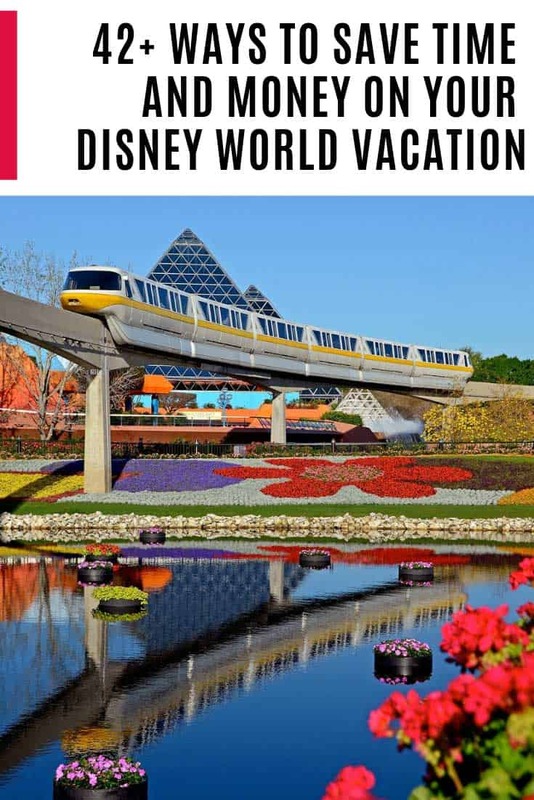 Disney World is not a place you can just rock up to and have fun, you need to get to know the attractions, the shows and the restaurants before hand so you can decide what you want to do. So treat yourself to a guide book. The other way to save time in the parks is to know exactly what you want to do and the order in which you will do it. For me this is the difference between a magical vacation and going home exhausted and never wanting to go back! It seems strange listing this as a hack because it’s a free perk included with your ticket, but so many people just don’t understand or make use of the Fastpass Plus system. In short this is how you reserve your place on rides and attractions in advance to reduce the time you spend standing in lines. Get the Fastpass 101 here! Many people don’t turn up to the parks until mid to late morning so if you can arrive for rope drop you’ll be able to experience attractions with little wait. Then get the most out of your fastpasses by making your reservations from 11am onwards. Some Fastpasses are like gold dust and unless you can book them at 60 days out you might find they’ve all gone. If you can’t get what you want keep on trying. On our last trip we gave up our much sought-after Seven Dwarves Mine Train fastpasses the day before because my kids were terrified by it and wanted to ride Winnie the Pooh instead! Disney World has two amazing water parks so make sure you leave time in your itinerary to experience them. And don’t miss our top tips on how to make the most of your visit! I know what you’re thinking, why is an article about Disney World hacks telling me to skip the themeparks? Well there is more to the Disney World resort than just the parks, here are 37 things you can do without a ticket! So be sure to plan some non-park days so that you can experience some of the other magic Disney World has to offer. If you ask some people what their favorite Disney World attraction is they will tell you it’s the food! Seriously. There are so many great restaurants and meals to experience, it’s actually lucky you have to do so much walking to offset the calorie intake! Here’s our favorite Disney dining tips to help you make the most of it. If you are a family of big eaters you might be able to save money using the Disney Dining Plan. Check out this post to see if the dining plan will save you money. If you do decide to invest in the dining plan (or you’re travelling during a free dining plan period) read our Disney dining plan hacks to be sure to get the most value for money! Then read up on how to get the most out of your dining plan snack credits! On our last trip I was surprised to see the number of people who just turned up at a table service restaurant without a reservation. It can be done, but rarely and not without a wait. We’ve got the 101 on Disney dining reservations here. If there is a restaurant you really want to eat at don’t give up if you can’t get a reservation the first time around. Keep checking right up until the day before you want to eat as sometimes people’s plans change and they have to cancel their reservations. Ok not completely, you’ll need all the energy you can get to make it through the day. But don’t waste hours sitting in a restaurant munching away when you could be in the parks for opening time. Either eat cereal or granola bars in your room first thing, or aim to eat brunch late morning instead. Speaking of late breakfasts, if you want to experience a character meal try booking one of the last breakfast slots. They’re quieter which means more character time, and you’ll save time by not needing to eat lunch! If you’re not doing the Dining plan and you want to save some cash it’s worth noting that many of the counter service entrees are large enough for two adults to share. Don’t miss our other Disney dining hacks! If you fall in love with something on a table service menu as for the recipe, often the chef will be happy to provide it. Or you can check out our collection of copycat Disney World treats that you can make at home. When friends hear that we’re going to Florida again they often ask how on earth we can afford it. While it’s true that Disney World is not the cheapest vacation destination there are so many ways you can save money. Here are some money saving Disney hacks for you! If you have a Target Red card put it to good use by buying Disney gift cards with a 5% discount. You can use gift cards in the park to pay for your food and souvenirs. Here are 4 more ways to gift card your way to Disney! Annual passholders get a whole raft of perks including free themepark parking, discounts on food and souvenirs and freebie souvenirs. Only one person in your party needs one so it’s worth comparing the prices. If you haven’t booked yet head on over to Get Away Today to check out their current specials. There are two official Disney clearance outlets in the local area called Disney Character Warehouses. You’ll find one at the Orlando Vineland Premium Outlet and the other at the Orlando International Premium Outlet. They have a wide range of official merchandise from pins and mugs to hats, shirts and stuffies so it’s well worth a visit. Grocery items in the Resort hotel gift shops are limited and expensive. You can save money by ordering your groceries ahead of time from Amazon Pantry and having them shipped direct to your room. One of the best Disney World hacks for saving time in the parks is to avoid the peak seasons. During the off season periods their are few people around and you’ll spend less time waiting in line. If you want to experience the magic of Christmas at Disney but can’t stand the thought of the crowds or the prices just go in November instead. The parks are decorated for Christmas during the first couple of days of November and the full festivities kick off around Thanksgiving. Whether you’re in your own car or a rental you’ll be pleased to hear that there are several gas stations dotted around the resort and they are often cheaper than the off property stations! My hubby and I made several trips to Disney World before the kiddos came along and boy is Disney with kids a whole new ball game! We have 6 visits under our belt now though and plenty of tips to share! Before you enter the park take a photo of your kids so you know exactly what they’re wearing just in case they get lost. Better yet wearing matching family Disney shirts so you won’t forget! It’s also easier to keep track of your family in a crowd when you’re all wearing the same top! If you have stroller age children then consider renting a stroller for your vacation. An umbrella stroller might be light enough to carry on a plane but they sure as heck are not fun pushing around a themepark! We prefer to rent a Baby Jogger instead. The folks over at WDW Prep School have a great article to help you decide which stroller company to use. Speaking of strollers this next hack will help you find yours in a sea of matching strollers. Just tie a brightly coloured scarf around the handle to help you spot yours. If you are travelling with a baby or a toddler check your park map for the location of the Baby Care Centres. They are a peaceful, air-conditioned haven where you can nurse, rest and eat snacks. The centers have proper changing tables and you can buy diapers and other baby essentials if you run out. Your kiddos will also love watching cartoons while they cool off! Behind Cinderella Castle is a store called Castle Couture which sells lots of princess merchandise. In the back you’ll find a room that is all staged for Disney princess pictures! It’s there for girls who have just finished in the Bibbidi Bobbidi Boutique but anyone is allowed to have their pictures taken in there. We have a series of posts filled with tips specifically for travelling with preschoolers. Be sure to read these before visiting the Animal Kingdom, Epcot or Hollywood Studios. There are so many tips and secrets you need to know about the theme parks and we’ve put our top hacks n this section. You can save time entering the parks by making use of the secret entrances that not many people know about! There are two parties held at the Magic Kingdom on select nights between August and September. Mickey’s Not So Scary Halloween Party and the Very Merry Christmas Party. They officially start at 7pm but guests are allowed to enter the park from 4pm so be sure to make the most of it and show up early. You can save time riding popular attractions like Expedition Everest, Rock n Roller Coaster or Test Track by opting for the Single Rider line. If you are travelling with children who don’t meet the height requirement for an attraction you can take advantage of rider switch. One parent stays with the little one while everyone else rides, then that parent can take a turn and up to two guests in your party can ride again! Whether it’s your first visit, your birthday or your anniversary head to Guest Services for your free button so cast members and even other guests can congratulate you. Whether you are traveling from hotel to park by monorail, bus, Minnie Van or rental car be sure you know in advance how long it will take you to get from A to B. The Disney World resort is huge and it can take 20-30 minutes to drive from one side to the other. Keep this in mind if you have dinner reservations or Fastpasses to use! You can score big and impress your family on Buzz lightyear’s Space Ranger Spin by hitting the left arm of the left robot in the first room for 100,000 points, and then aiming for the bottom of evil Zurg’s space scooter (right near the end of the ride) for another 100,000! Don’t miss our other Magic Kingdom tips! Are you brave enough for Beverly? While you’re in Epcot head over to Club Cool to sample some Coca-Colas from around the world. The drinks are free and tasting the Beverly is a must do! I remember when we were kids being bundled out of the Magic Kingdom before the fireworks had finished to beat the crowds. Only problem is a lot of people have the same idea! So do the opposite. Enjoy the show and then treat yourself to a late night ice cream and wait for the crowds to die down. The Kiss Goodnight is definitely worth staying for! It’s a great time to take some magical Cinderella Castle photos too! They officially start at 7pm but guests are allowed to enter the park from 4pm. Over at the Magic Kingdom at the firehouse just by Guest Services you can sign up to play the free Sorcerers of the Magic Kingdom game. Each person in your party will receive some trading game cards and the challenge will take you all over the park. We also bought a game board from the Emporium so we can play with the cards at home. When we’re counting down to our Disney World vacation we enjoy spending our time doing Disney DIYs. Here are some of the things we love to make! Sure you can buy one when you get to the parks but where’s the fun in that? My kids enjoy making their own autograph books ahead of our trip and the characters love to see them! Family photos look cute when everyone is wearing their ears! Get your Disney on by making DIY Mickey ears at home. On our last trip I was in awe of the amazing Disney shirts people were wearing. Check out these ideas for DIY Disney shirts you can make at home. Or see these free SVG Disney files if you’re lucky enough to own a Cricut or Silhouette machine.